I don't know this particular green fleur de lis 3 feathers Limoges mark, so if anyone else has any information please try to help with this one (check out the comments section below for replies). I looked in my books but found nothing under 'shield' marks or Limoges that fitted this description. Maybe it's obvious and I missed it. Hi. I'm also interested in the mark. I have two sets with the backstamp. Are those three feathers or are they smaller fleur de lis? Would be grateful for any info. Thanks. Hi. Forgot to mention that the shield mark is very similar to the Elite mark -- having the three small fleur de lis at the top and rather the face of a man, a larger fleur de lis. Have several pieces with this mark and have spent hours trying to track it down has anybody found out about it yet.My pieces were also of the 1930's.Have looked specifcally for manufactures of thr time but can find nothing. From my humble and limited research and experience, I believe there are two back stamps involved. If anyone out there can correct me, please do! The under glaze "LIMOGES FRANCE" appears to be part of the Wm Guerin Mark, and the over glaze fleurs de lis shield mark, is so similar to the Saint Martial mark used by Bawo and Dotter (Elite), that I believe it to be one of their's. I have one set where most pieces have both these marks; and then, there are several other pieces in the same set that have the full Guerin mark under glaze, then, stamped over glaze with the shield mark. So...my view... as explained in my eBay listings, is that these are porcelain blanks made by Wm Guerin and decorated by Bawo and Dotter (start 1890's). Guerin was around a long time before then, producing and decorating their own. Guerin merged with Jean Pouyat around 1911, who had it's own history-- both probably supplied B&D with blanks for decorating. Bawo and Dotter took over Guerin around 1920-21 ... becoming Guerin/Pouyat/Elite. The Depression arrived; closing the company in 1932. AGAIN... this is my understanding as humble as it is. Any addition, correction, or comment is welcome and encouraged. Has anyone discovered the origin of the green shield with the fleur-de-lys stamp? I, too, have a set of 10-12, given to me by my grandmother. It has a scattered pink rose pattern with gold trim. I have the same mark on what looks like a briar rose pattern. When she was getting married in the 1920s, my father's cousin was taken by her father to Toronto "to buy her dishes." I have not been able to find out anything else so far and this is the first time I have seen the mark on another pattern. Janet, your set sounds just like mine! I too have been trying to find out more about this pattern..mine originates from 1930's or abouts as well..looking at the quality..(looks brand new...does not crack like others)..i'd say it's very valuable.. 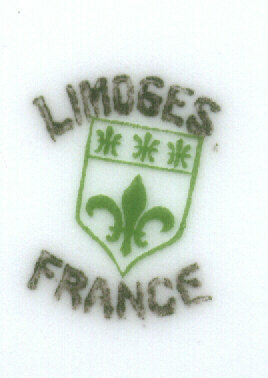 When it comes to being a collector you need to understand the different marks that you will find on pieces of Limoges. The earliest pieces of Limoges were done by royal commission and these will have a Fleur de Lys on them, these would be very rare pieces and not ones that you will find at every antique mall across the US. I have spent hours looking to identify the dishes I inherited from my mom. They are identical except mine are trimmed in gold. The same flowers and mark on the back. I would give anything to be able to identify and value these dishes. Help someone! I am not sure why the last few posters are still asking for help on this one as Jack (jaapies-- ebay store) has kindly given the most comprehensive answer you are ever likely to get on this on (just scroll up to find it). 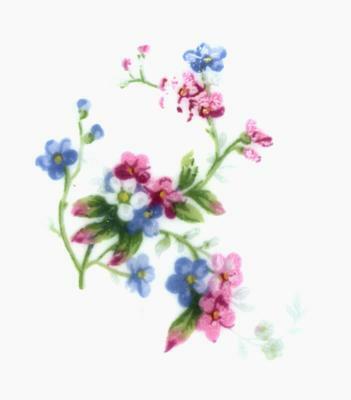 I'm looking at a cup and saucer in this pattern of small blue/pink/white flowers and a gilded edge with the same back mark of the green shield with a large fleur de lis topped with three small ones and the words Limoges France. However I just found this listing on Etsy which has the exact same pattern as the one in front of me and a backstamp of Haviland. I have a demitasse cup with this stamp. Visit my page to view ....I thought you'd like this Pin on Pinterest... http://pin.it/ZI1u8z2 you prob have to cooy and paste this link. I have also heard these pieces are by royal commission. Any info I'd love to hear it also. I too have a setting for 12 with serving pieces which belonged to my wife's mother. I believe it dates from 1920's and is rimmed in gold. Any info would be appreciated. I too have a set of Limoges with this hallmark. It belonged to my wife's mother, pattern is red and yellow roses, and is rimmed in gold. Any info would be appreciated. I have 12 place setting with serving pieces. I have a large set including gravy tray, serving dishes, platers and an extensive dinner set. Who does one talk to I order to evaluate value? I think I might be able to confirm what many people think on this mark, I have a set for six plus serving pieces and on the cups and saucers it has two marks including the normal Elite mark.